Unbelievable! Another month has come to an end! And incredibly, another year too! But didn’t we end that year in style… by solving some present problems, meeting some cute berries, and having an amazing Christmas party! And also getting to meet Waui Design, Heartlocked, and Fruity Cuties too! And let’s not forget our monthly puzzle! Did you work out who the Mischief Mascot had all wrapped up? That’s right! It was the Snowman Mascot! Well, if you’re going to have a Christmas themed puzzle, you might as well have a fittingly festive Christmas themed answer to go with it! Don’t you think? Anyway, that’s all for this month folks, and this year, but be sure to come back in 2012 when we’ll be bringing you all the newest and cutest kawaii goodies for your viewing pleasure! Woohoo! You see, much in the same way that puppies aren’t just for Christmas, I’m of the opinion that parties aren’t just for New Years! 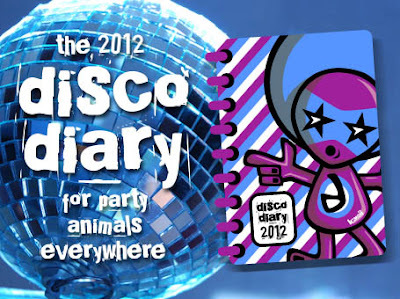 And what better way to keep track of all these parties than with a super cool diary featuring your own sweet self! Good idea, isn’t it? And one that I reckon could really take off with party animals everywhere! What do you think? Hey, that’s not a bad idea, Dave! And the illustration is pretty sweet too! Although there is one slight problem… for true party animals, everyday is a party! So what would they need a diary for? It’s the utterly wonderful world of Winter Petals! 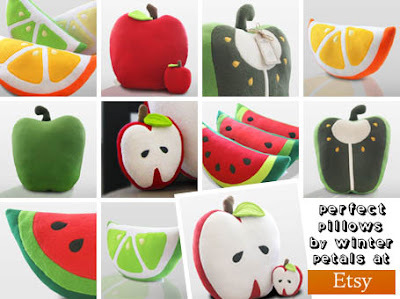 Winter Petals is an Etsy shop that specialises in making adorable pillows that drip with kawaii cool. So now you can relax in stunning style thanks to the crafty creations of this dreamy designer! And why shouldn’t you? I mean, we all deserve a little bit of a rest every now and again, don’t we? Of course we do! So put your feet up and enjoy yourselves! You deserve it! Yipee! It’s puzzle time! And this month I’ve got a fittingly festive treat in store! Yes, you’ve guessed it, it looks like Christmas has arrived ahead of schedule here at the KawaiiPunk blog! Well, it has in the puzzle department! But, as is so often the case around here, it seems that things have not gone entirely to plan! And why is that? Three words: The Mischief Mascot! 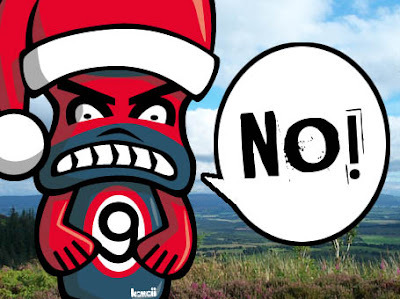 Yip, it appears the Mischief Mascot has wrapped up something he shouldn’t have… another KawaiiPunk mascot! Oh, the horror! So the question is… can you work out which of his colleagues the mischievous Mischief Mascot has got all wrapped up? Find out if you can when the answer is revealed in this month’s monthly round-up! And, in the meantime, Merry Christmas! I know, they are great, aren’t they? 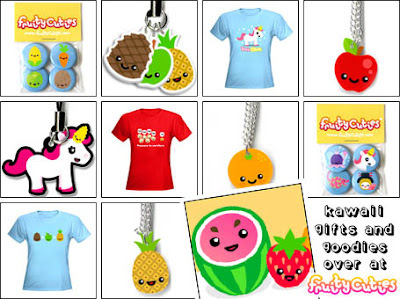 Fruity Cuties are a collection of super cute characters with their very own fun filled website and shop. So if you’re looking to brighten up your day with some kawaii fun and games, then these little guys are definitely the ones to help you! And they can also help you brighten up your style too with t-shirts, badges, necklaces, and accessories! How cool is that? What you are looking at above are just some of the gruesomely good goodies available from the creepily cool Curua! And at the Curua RedBubble store you can pick up these dreamily dread-filled designs on all manner of clothing and stickers! And, I’m more than happy to report, it’s got more than its fair share of zombie designs among them! Marvellous! Merry Christmas, everybody! Mwah ha ha! Yes, that’s right, it’s some kawaiified holly berries! Granted, it is a somewhat predictable choice, but I reckon it’s a decidedly fitting one nonetheless! After all, isn’t Christmas a time for tradition and fun? I know it is at my house! Anyway, I do hope you enjoy this festive piece of kawaiification, and I also hope you and your readers have a wonderfully fun filled Christmas when it finally arrives! Merry Christmas! Simply incredible! It appears that once again you have produced another absolute stunner, Mr. Justice Smithering Smythe! 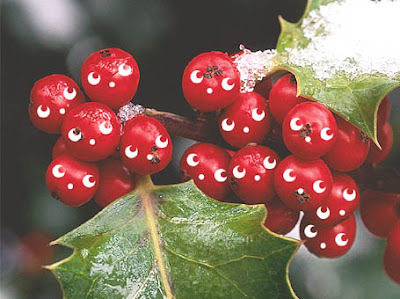 Kawaiified holly berries! Just perfect! But then again, given your previous creations, I’ve come to expect noting less! Beautiful, isn’t it? At the Heartlocked shop you can buy t-shirts, mugs, stationery, iPhone cases, coasters, necklaces, and much, much, much, much more! In fact, if I was to list all the products you can buy from this incredible shop, I’d probably still be here blogging in another three years time! And that’s without even mentioning how sweet the designs featured on these products are! So my advice… head on over and have a good look around for yourself! Trust me, you won’t regret it! I was wondering if you could help me with a problem I’m having. You see… this Christmas I’d like nothing more than to get my hands on Doggie Doo - the game that is, not the… well, I’m sure you know what I mean! Anyway… while you undoubtedly think this is a perfectly reasonable present request for a five year old such as myself to make, unfortunately my parents think otherwise! They reckon Doggie Doo is nothing more than a crude novelty, rather than the genius toy it so clearly is, and are refusing to buy it for me this Christmas due to their aforementioned hideously misguided views! So I was wondering… do you think you could give me some sneaky tips to help me get the present I want? I’d be ever so thankful! 1. The gift voucher gamble! Asking for gift vouchers is usually is a sure fire way to ensure you get the present you want. Unfortunately, however, your parents sound like the kind of idiots who would buy you book tokens instead, so use this one with care! 2. The fake endorsement strategy! Parents these days are absolute suckers for celebrity endorsements, especially if that celebrity is a do-gooding parent themselves - Jamie Oliver, Myleene Klass, Gwyneth Paltrow, etc. Just tell your parents you saw one of these clowns endorsing the present you want and watch them change their tune quick style! Result! 3. The table turner! If your parents are still insisting on buying you a Christmas present you don’t want, then it’s only fair you buy them something they don’t want in return! For instance… Doggie Doo! After all, since you’re only five years old, they’ll still be the one’s paying for it! 4. The shopping basket slip-in! A risky strategy, but one that can be highly effective! Next time you’re at the supermarket with your folks, try slipping the present you want into the shopping trolley when they’re not looking! Or better still, suggest your parents start buying their groceries online - this makes the adding of extra items even easier! Welcome to the wonderful world of Wolf Bait! 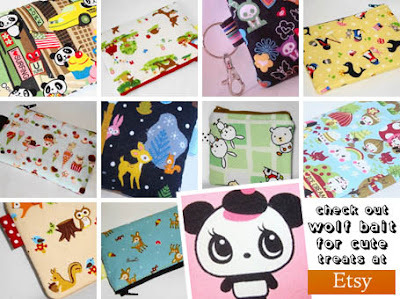 Wolf Bait is an Etsy shop that specialises in making super cool bags and pouches for stylish gadget fans everywhere. And with an emphasis on using the cutest Japanese fabrics available, these handmade bags are more than a cut above your average accessory fare! And they’re also incredibly cute too! Result! Woo hoo! It’s December! My favourite time of the year, bar none! Well, being the Frost Mascot I’m hardly likely to be singing the praises of July now am I? Of course not! But it’s not just the lovely freezing cold December weather I’m excited about! Oh no! It’s also the festivities that go with it! Can you guess what I’m talking about? I’m pretty sure you can…it’s Christmas! Yippee! And what does Christmas mean? It means me and my colleague the Snowman Mascot finally get a chance to show off our wonderfully wintry wares to you lot. 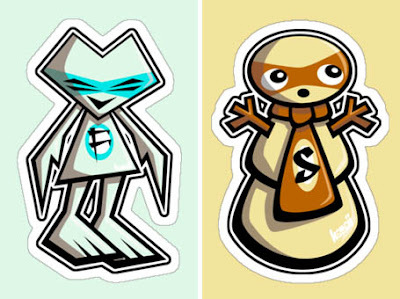 Like the amazingly cool stickers pictured above available at the KawaiiPunk RedBubble shop! 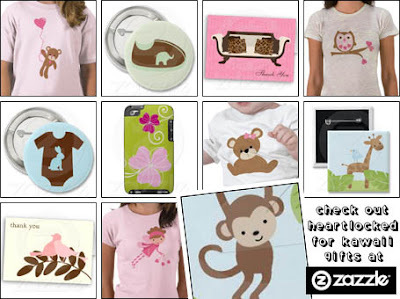 Or if they don’t get your festive juices flowing, then why not visit our Zazzle or CafePress shops to see if anything takes your fancy! 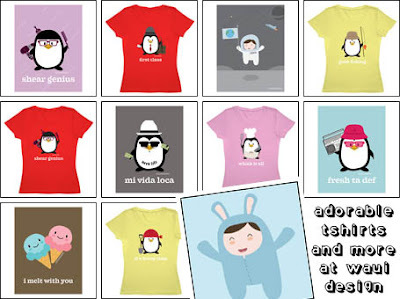 Like our cards, clothing or badges for instance? Any one of which I reckon would make an ideal Christmas present! But then again, I reckon I would say that, wouldn’t I? Ho ho ho! Faking enthusiasm could serve you well this month, especially when opening Christmas presents! Practice nodding and smiling now and you should be OK! Saving a bit of money at this time of year is indeed a prudent move. Doing so by not buying any Christmas presents isn’t! You have been warned! Dressing up as an elf can be a lot of fun… for a child! Doing it as a grown up however, is just a bit weird! Remember this! Choosing the perfect present for a loved one can be a rewarding experience, but most of the time it’s just a time consuming nightmare! Solution: gift vouchers! Planning ahead by at least three months should save you a lot of time this Christmas. Hmmm… guess I should have told you that earlier! Sorry! Getting into the Christmas spirit and getting into the spirits at Christmas is not the same thing! Remember this to avoid embarrassment at parties! Spending time with family is a good thing to do at Christmas. Just make sure it’s your family you’re spending time with! No one likes a gatecrasher! The joy of giving can be just as rewarding as the joy of receiving. Keep telling yourself this to avoid disappointment this Christmas! Tee hee! There’s a fine line between tradition and desperation at this time of year. Use that mistletoe sparingly! You know what I’m talking about! There’s a time and a place for Christmas carols. Three o’clock in the morning on the way home from a party is neither! Just letting you know! Leaving your front door wide open to save Santa the bother of climbing down the chimney may sound like a good idea but, trust me, it really isn’t! Don’t worry if you don’t get the present you want this Christmas. After all, there’ll be another one along in a mere 12 month’s time! Wohoo!